Grim Fandango to be re-released on PS4 and Vita… for now? We tuned into the PS4 E3 presser out of curiosity about how the other half live, but nothing could have prepared us for the shock of seeing a Grim Fandango remastered re-release for current PlayStation systems like the PS4 and Vita. But no word on a PC version. Oh, Sony press conference, you are an emotional rollercoaster. Tell you what’s encouraging about this, though: Sony’s Adam Boyes remarked that this new edition of Grim Fandango was made possible thanks to Sony’s “good friends” at Disney. Reading between the lines, does Grim Fandango’s return herald an interest on Disney’s part of actually making LucasArts’ classic games available one modern systems? Grim Fandango is one of the great adventure games, and its absence from modern platforms was a tragic blow to games’ cultural legacy. Of course, the same could be said about many of LucasArts great games, yet under Lucasfilm, there seemed to be zero interest in bringing them back to modern audiences. This could just be another miracle that Tim Schafer has pulled off simply by being one of the most charming and determined developers around, but we can certainly hope it speaks to Disney’s broader intentions about what to do with the games it inherited from Lucas. Unfortunately, Boyes also said that Grim Fandango is a PlayStation exclusive. Hopefully, that’s not a permanent condition. 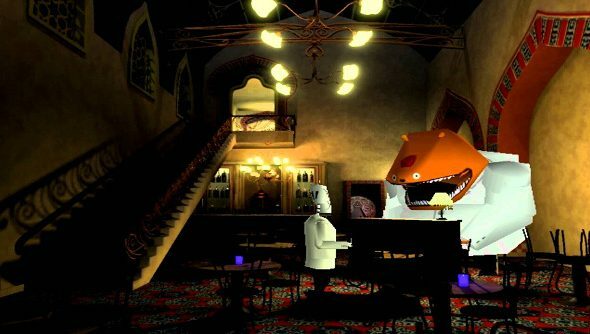 Grim Fandango was born on the PC, and it needs to come home. Because if it doesn’t, I may have to buy one of those damned boxes. EDIT:Okay, my buddy and PC Gamer editor Cory Banks is talking me off the ledge. Tim Schafer, I knew you wouldn’t leave us out to dry. Talk about other platforms soon! Sony’s been a great help making this happen & we’re excited to be working with them on the console version!